As a crumpet eating Brit, China can sometimes look like a crazy lawless place. From the outside looking in it appears that everything there is a fake version of something that costs us an arm and a leg over here. Even the cars. Third party manufactures, long a moral battle ground amongst much of the fandom, are no longer immune to this and face the same problems as Hasbro and Takara do from companies knocking off their toys. Case in point is today’s article on Wei Jiang’s Reaver. Beginning life as Shinebug, Toyworld produced him as an homage to G1 Goldbug who himself was the resurrected form of Bumblebee. I’m going cross eyed. As someone who usually doesn’t buy KO’s this is an interesting one for me so I figured it was worth doing a mini review. Literally (ha, I keep making that joke). Asked to name a British car, the first name that will let fly from the lips of most (non British) people is the Mini. Revamped in the early naughties (a term that should never have left that period), with sleek new curves and it’s size extended beyond that of something that would Ryanair’s stingy cabin luggage size limits wince, it’s this version of the venerable British style icon that Toyworld went to for Shinebug. Confusing Reaver’s already dubious moral position as a knock off of a third party toy, Toyworld have pilfered BMW’s intellectual property to create a highly accurate toy of what I think is the Mini Cooper Coupe. Hmmm. As far removed from a VW Beetle as the Mini’s look is, it fit’s like a Power Glove as a modern interpretation of Bumblebee. In fact, I am kinda surprised Hasbro never opted to go for that with any of the 18 gajillion Bumblebee toys they’ve inflicted upon earth’s poor innocent toy isles. It’s certainly a more fitting vehicle than say a huge yellow super car. When Spielberg rattles on about Transformers being at it’s core a story about a boy and his car (proving he looked up the wrong franchise entirely), how many teenagers do you know who drive around in fancy muscle cars? Probably Justin Beiber but he’s purely a CGI creation – not a real boy. Toyworlds base design is pretty strong if not a little bland. Real world accurate car details are faithfully recreated with painted lights but paint is spread thinly on a “where it needs to be” basis which makes you realise how much work the stickers that are so tied to the Transformers do in making the alt mode more memorable. G1’s early output presented us with vehicles that mostly had a particular purpose so featured a specialised livery that made them interesting. Prowl was a Police deco, Jazz, Wheeljack and Smokescreen had full racing dress whilst Red Alert was given the role of serving the fire department for some wonderfully bonkers reason. Robots in disguise rarely meant just looking like your bog standard family hatchback – the finery gave them character. Having never owned Toyworld’s original figure, I am not in a position to compare them beyond what my eyes can see from using the Google machine. Wei Jiang’s Reaver looks identical save for it’s giant size, locks together tightly and has the same suspiciously swirly gold plastic. Lt. Dwayne Hicks: “How long till it blows”. Gold plastic syndrome (the other less cool Yoda voiced GPS) is a process which has caused many toys from the 80’s and 90’s to crumble into heart breaking piles of dust. Will that kick in here? There’s no way to know, I mean why would anyone deliberately use that technique in 2016…but then I can’t imagine that KO toy makers over in China, stealing other companies designs and flogging them on the cheap really care too much about longevity. It feels strong and robust in hand, but that’s how GPS gets you. Sucking you in it entices you to play with it and the next thing you know you have a footless Thunderclash. Not Footloose Thunderclash, that would be amazing. Aside from looking like a rolling Caramac, and far from the often fiddly, fragile, intricate, scale model feel many third toys have – Reaver is an incredibly solid brick of a toy. Everything is compact and snaps together so tightly it actually becomes a bit of a pain to prise it apart. GPS may cast a long dusty shadow over the toy but for now I could probably lob it at the cat that keeps peeing in my garden and expect a call from the RSPCA. Car mode isn’t where this guy really shines though – that comes next. Nothing new makes it way into Reaver’s transformation that isn’t present on Shinebug. Tolerances for a KO are surprisingly good with a few sections perhaps being a bit tight along with that gnawing fear of the looming threat of GPS. A dip in quality was expected but in recent years some KO’s have emerged that are superior to the originals. This one leaves me baffled though, as for my £11 shipped from the other side of the planet I was expecting loose joints and a transformation that would leave with me a small pile of parts and empty bottle of clear nail polish. Instead Reaver makes Takara charging me £150 for crappy quality control on a Masterpiece Ramjet seem like an expensive way to get kicked in the unmentionables. By unmentionables I mean balls. Not only is QC generally great on the figure – he looks the absolute business in robot mode too. Giving him a modern, completely different alt mode was an inspired decision and Toyworld followed that up with an alt mode that is fresh but is perfectly identifiable as Goldbug. Especially that gorgeous, light stealing head sculpt. We are still in homage territory, as emphasised by the Dreamwave style puffy proportions but subtle details are recognised by your brain long before your eyes. For example, Goldbug’s original toy had a chest formed from the roof, just like in his past life as Bumblebee. Shinebug/Reaver switches it for the car’s bonnet but if you look closely below it part of the windscreen still pokes out in a clever call back to that detail. It’s a nifty trick that plays with an established feature in a new, creative way unencumbered by having to strictly adhere to a vintage design. That to me is where third parties are at their absolute best, freed from restriction and allowed to let creativity tackle something in a way that is familiar but brings something fresh to the table. 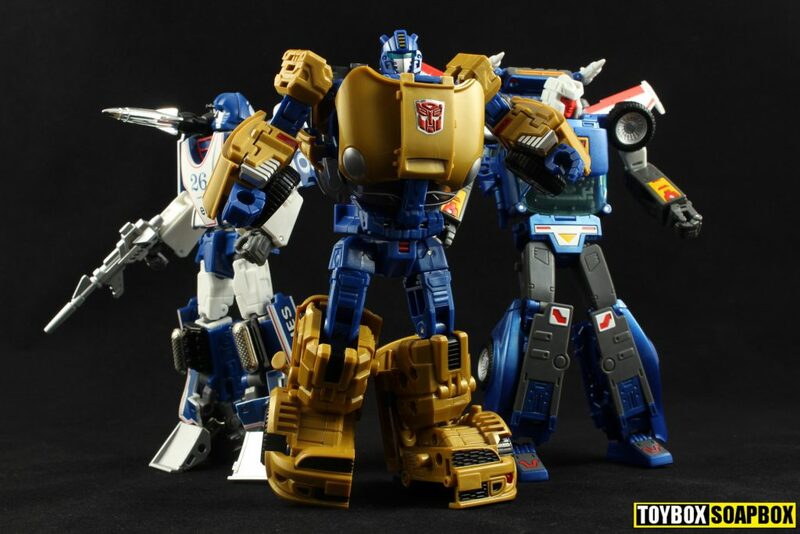 Wei Jiang’s Reaver evokes Goldbug and that’s all it has to do to capture your imagination – which is the reason I still buy toys whilst moaning about my mortgage. In robot mode, Wei Jiangs QC bods have done just as good a job with the only slight niggle being that the left chest panel is a little wobbly. Every other joint is tight and hasn’t suffered in transition to Wei Jiang Reaver’s new size. He stands with no problems and his arms don’t struggle to hold up his gun which is usually the acid test for these sorts of things. Incidentally, that gun hides away in alt mode as the car’s exhaust which is kinda neat. Has anything suffered from the upscaled size? No, other than perhaps where he fits on your shelf. Standing the same height as an Masterpiece car is probably makes him too tall for folks who care about scale and there is no defined collection to which he would belong. If you don’t care about scale, like moi, then that isn’t even a consideration and you can stick him with your MP cars having a tea party or something. That’s how I like to imagine mine. We are in strange territory with this and I am not sure what the moral stance is here as it’s a knock off of a third party toy from a company that profits from stealing Hasbro and Takara’s IP, and that’s before you also take into account the car manufacturer and the Transformers line being founded on using unlicensed car designs (though in those days they didn’t have to). As a big fan, and supporter of third parties it’s hard to work out how comfortable I am with this. I had zero interest in Toyworld’s original Shinebug, and it was only the price of the KO that piqued my interest. I know many people find KO’s abhorrent and many others don’t care – they just want what they want as cheaply as possible. Should morality even come into toy collecting at all? Do we just buy what we want without caring? By being fans of the brand does that mean we already have a stake in caring about what may harm it? Why is KO’ing official Hasbro and Takara products seen as less taboo than third parties? Toys like Wei Jiang’s Reaver pose many interesting questions about the ethics of collecting, but taken by itself it’s a brilliant toy that outstrips the original at an insanely seductive price. But is that price one that will come due in the longer term future?